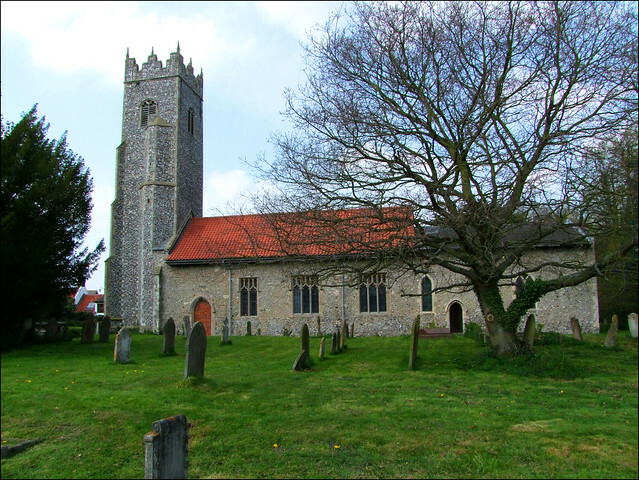 I had been cycling around the area to the north of Acle, where virtually all the churches are open everyday. The churches were a pleasure, but the roads were not, because even in spring they were thunderous with traffic. While the smaller country roads are pleasant enough, there are so few crossing points of the various rivers that all the traffic comes together. The Acle to Stalham road is not one I would recommend to any cyclist. In one sense, then, it was a relief to cross the Bure at Acle again and head south into the quiet, pretty rolling lanes, threading their way through fields and copses. But I knew that I was entering one of Norfolk's few areas of locked churches, which is always a bit depressing when you are hoping to visit them, and here at Strumpshaw even the keyholder notices ran out. No welcome for pilgrims and strangers here. And so this medieval building which has stood for centuries, a beating heart of its faith community and a touchstone down the long Strumpshaw generations, is no longer in use for its proper purpose. As if to accentuate this, St Peter is a tall, forbidding building. The late 15th Century tower has been left stark by its 1890s restoration. When they restored the long nave in the early 19th Century, they lowered the roof, and this only adds to the severity of the tower. One of my regular correspondents, who had seen inside the building on a Historic Churches Bike Ride day, tells me that he thinks I haven't missed much, as the interior is one of the dullest of any medieval church in Norfolk. But I would like to have seen the remains of the screen, which Cautley thought, in construction, must have been much like the famous one at Ranworth. Instead, all I could do was potter around the graveyard, where I found a couple of delightfully deeply cut reliefs and several memorials to the Coffin family, one of whom, dying in 1781, had been 56 years clerk of this parish, which at last gave me an inkling of those long generations. Though it seemed a shame that the most interesting and welcoming thing about Strumpshaw was the dead.